How our Bradenton injury doctors can help. Hess Spinal & Medical Centers employs a staff of medical doctors, chiropractors and therapists in our Bradenton Treatment Center. We can help with your recovery from most accident related injuries with a full range of on-site care and therapies. 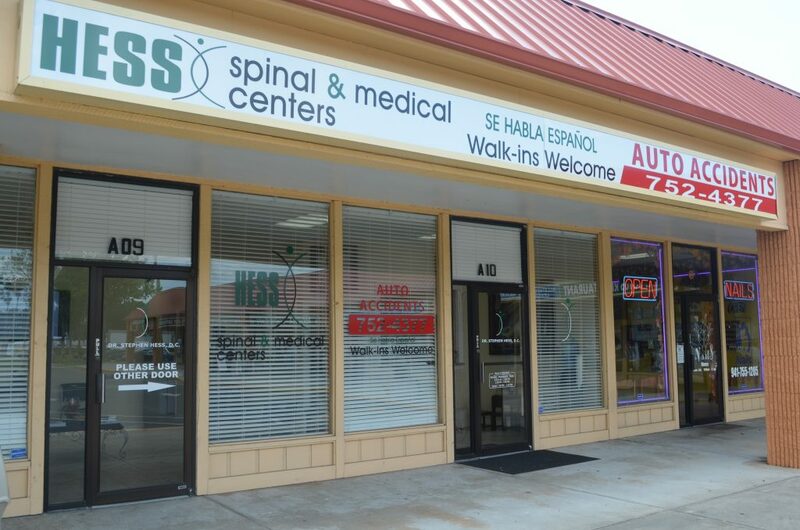 If you’re in the Bradenton area and looking for a world class accident treatment center, call Hess Spinal & Medical Centers today! Car accidents are stressful. You have to deal with the police report, exchange insurance information, and most likely have to have your car taken to a mechanic for repairs. If you find yourself dealing with major or minor pains in your neck, back or shoulder, you MUST CALL a medical center within 14 days of the accident for your claim to be processed through insurance. Even if you think it might not be a big deal, the pain over time might get worse. Call Hess Spinal & Medical Centers ASAP to schedule your free appointment and evaluation at (800) 618-4377.